How visual journalism tackles social controversies. The People’s Republic of Bolzano is a visual journalism project, part of my research activity at the Unibz, that debunked the cliché of a Chinese invasion in Bolzano, a South Tyrolean city in Italy, populated 26% by German speakers and 73% by Italian speakers circa (source: Astat). After decades of tension between the two communities due to ethnic conflicts, only in the last 20 years the two learned to co-exist together. Migrants played a crucial role in this integration process, they changed the social dynamics and raised new questions to answer. 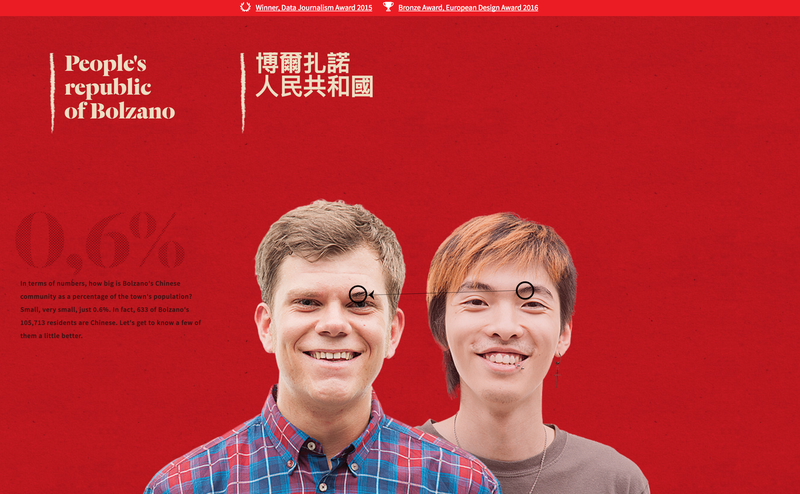 Project’s header that metaphorically displays the contamination of the local identity with the Chinese one. It’s the 0,6%, and it corresponds to a small portion of the eyebrow. Despite the fact that a Chinatown doesn’t exist in Bozen-Bolzano, and Chinese make up just 0.6 per cent of the population — 633 of 105,713 citizens — (Astat, 2014) — some locals expressed fears of an ‘invasion’ of Chinese people in the city. A number of factors also contributed the feeling of an invasion. First of all, Chinese people usually work in public spaces — in restaurants, bars, shops and hairdressers; they are more visible in the city than other migrant communities that usually work away from public view in construction sites or in the apple fields that surround the city. 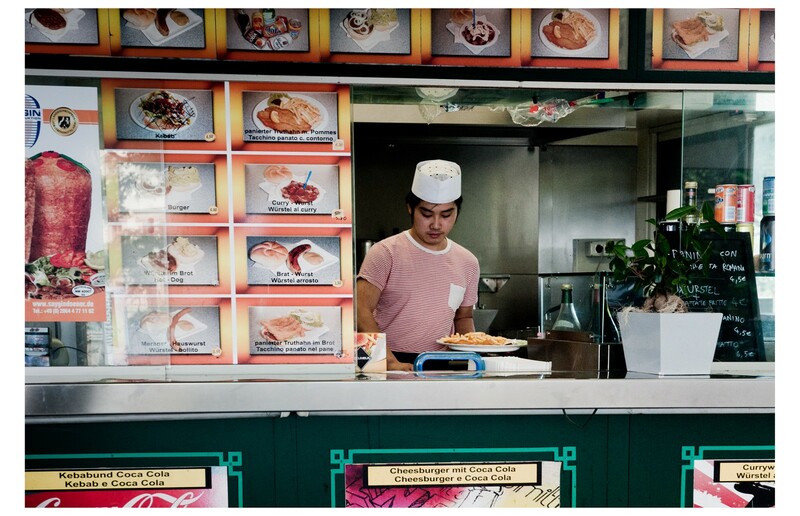 Yanghui Chen opened a traditional Tirolean wūrstel kiosk, instead of working in the Chinese restaurant run by his family, as the tradition wants (ph. Claudia Corrent). Second, the most read newspaper by Italian people in Bozen-Bolzano, the Alto Adige, stirred up migrant worries, running articles with headlines warning of the creation of a ‘Chinatown’ ghetto, of a ‘Chinese advance’, and ‘Chinese megastores’ depicting a context very different from the reality, most frequently in years of ‘big’ Chinese business openings between 2007 and 2011. Design can plays an important role, it engages with public controversies and expose users to a transparent information, make data available to publics, return a more accessible narration on complex phenomena. All the factors above contributed the cliché of the ‘invasion’. With journalist Fabio Gobbato, we decided to investigate. We began experimenting with new ways to tell stories with data in order to open a window into the Chinese community of Bozen-Bolzano; to show who the Chinese living in the city were; what they thought of Italy; and moreover that the story of ‘invasion’ was far from reality. We then analysed economic statistics provided by the local Chamber of Commerce to examine if an economic ‘invasion’ had happened in the city. We found that out of the 9,543 companies in Bozen-Bolzano, only 126 (1.3 per cent) were Chinese-run. The data from 1996 to 2013 showed us that the businesses were located all over the city and not in any particular spot; and that the type of Chinese-owned businesses had changed during the period (from bars and restaurants to a huge variety of activities such as shops and hairdressers). The data again refuted the idea of a Chinese invasion or a ‘Chinatown ghetto’. Through the data map, we were also able to demonstrate that a Chinatown district didn’t exist — as the map clearly showed businesses owned by Chinese nationals were spread throughout the city — despite reports by local newspapers. The data again refuted the idea of a Chinese commercial invasion. We discovered some interesting statistics: out of 441 bars, 51 (11.5 per cent) were managed by people with Chinese nationality; of 261 restaurants, 32 (11.8 per cent) were Chinese, the 11.8 per cent of the total. Evidence certainly that Chinese nationals who have settled in the city are entrepreneurial in the service industry, but hardly evidence of much else. The data painted a very clear picture: Chinese in Bozen-Bolzano were so few and their activities so fragmented across the whole city that an ‘invasion’ was hard to imagine. But for us it was very important not only to demonstrate this but also try to shift the perception of the Chinese among locals in the city. Too many clichés has been allowed to develop, and misinformation had contributed to the creation of a distorted perception. To accomplish that, we decided to combine qualitative and quantitative investigative methods and took an integrated approach to the story. We met, and then included, Sara Trevisiol in our team, a cultural anthropologist with a strong knowledge of Chinese culture and deeply connected to the Chinese community of Bozen-Bolzano. Thank to her support, we shot eight interviews following the anthropological qualitative model. This human-interest approach allowed us to tell the story of the Chinese community in the city, via a series of personal narratives, something data alone could not do. Moreover she contributed in the continuous re-negotiation of the right words and terminologies among the design group, in order to avoid the fostering of new cliches. Qualitative interviews shows what data can’t tell: personal stories. Thanks to her work, we were able to represent how multi-faceted the Chinese community members of Bozen-Bolzano are. Through their voices, we were able to break through a number of misconceptions of Chinese people living in the city. Yanghui Chen comes from Zhejiang and has been in Italy since he was 4. The interdisciplinary team, composed of two designers, a journalist, a cultural anthropologist and a computer scientist, told the story from their respective points of view, revealing different sides of the same phenomenon. 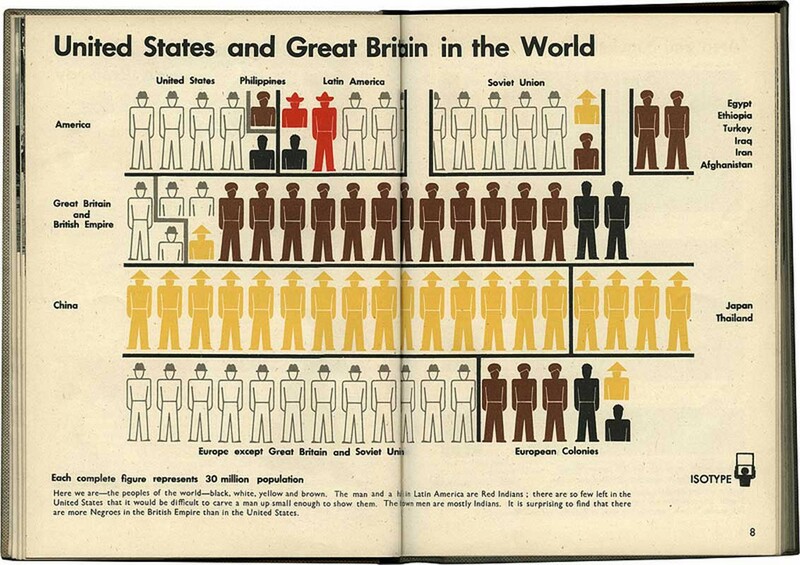 I found inspiration in the work of Otto Neurath, an Austrian philosopher, sociologist and political economist, who invented ISOTYPE — a universal language to educate people after the World War I.
Neurath, was also foremost in the shift of thinking about data visualisation as purely a form of analytics toward thinking of visualisations as both educational and informative, through the work of interdisciplinary teams combining experts, graphic designers and a ‘transformer’ — a role that he defined as ‘responsible for organising the information in visual terms so that it could be understood easily’ (Twyman, 1975: 7–18), a sort of visual and cultural mediator. This interdisciplinary approach was useful in our long-form investigation using data, where the journalist told the story; the designers visualised it in order to make it more appealing; the computer scientist created the interactions to engage the users in the navigation; and the anthropologist qualitative interviews enriched the narrative. Since its publication, the project was fully acclaimed, being awarded with the international Prize Journalism Award in June 2015; from then on it started having an international relevance which also benefited the local debate. Indeed, four months later, probably pushed by all the media coverage our project had, Alto Adige newspaper published it on its online platform, on its social network platform and on a spread, with an unexpected headline: “Macché invasione: i cinesi in città sono solo lo 0,6%” (“Which invasion: Chinese in the city are only 0.6%) and a secondary headline that mention the design intervention as source. It opened up a local debate on the Alto Adige social network where followers discussed on presence and the integration of the local Chinese community, on a more transparent and informed basis the project provided, leading also a secondary wider reflection on the way citizen get informed. The project made emerge a different narration that has reshaped the online depiction of the local Chinese community to open a local debate around the social controversy. 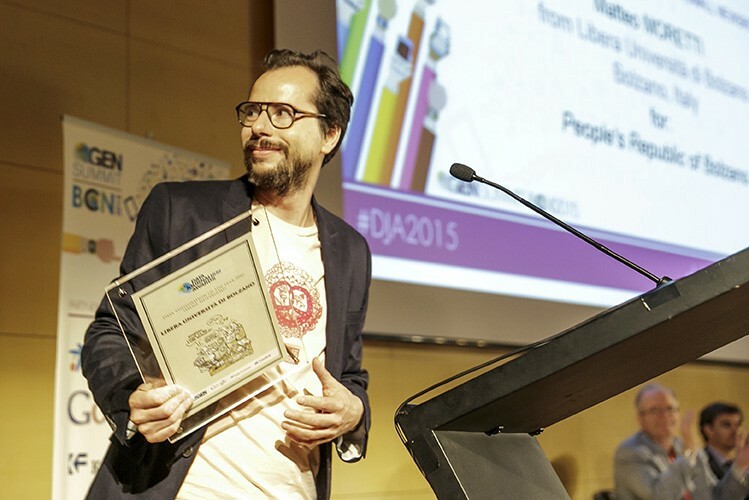 Subsequently, the project has been also disseminated in Italian and Europe in design and journalistic events, festival and conferences, being also awarded with the European Design Award 2016, widening the debate on the transparency of information, and on the way design could help in reducing the misinformation, making data and facts publics and accessible to a wider audience. Indeed, the project has been published on many international magazines, newspapers and field specific magazines (popular science publications). Discover our project People’s Republic of Bolzano! I design immersive, interactive, participatory, informative experiences. Then I write & talk about them. We connect data, design, and science to empower your organisation’s strategy.